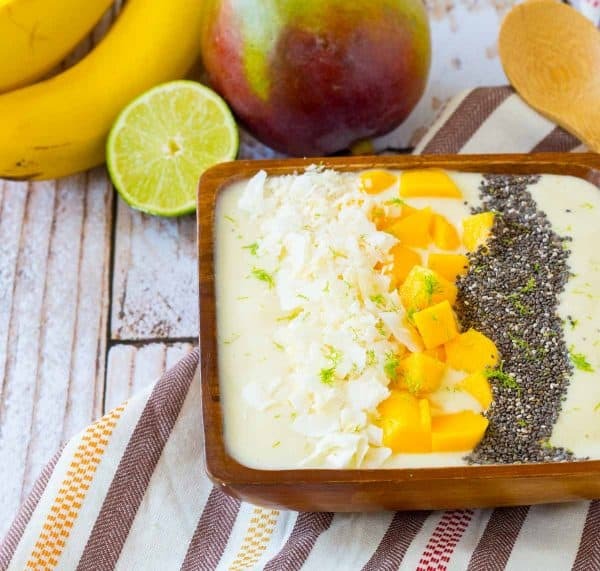 Filled with the flavors of the tropics, this tropical smoothie bowl will be your new favorite way to start the day. The flavors of the bananas, coconut and pineapple will transport you to somewhere warm and sunny. Smoothie bowls, all the rage right now, right? I happily hopped on the bandwagon with my blueberry apple crisp smoothie bowl, and I haven’t looked back since. Since you all listen to me talk (write) quite often, it’s probably no secret that I’m a toppings girl. 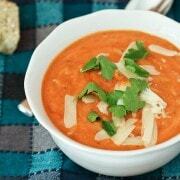 Give me a smaller bowl of chili, because I’m going to need tons of room to pile on the cilantro, green onions, cheddar cheese, and sour cream. Give me a baked potato and you can bet if there are toppings in sight, my baked potato will be a loaded one. Taco Tuesday? YES PLEASE. 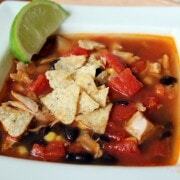 Bring on the cilantro, lime juice, lettuce, avocado, and whatever else I can pile on. Oh and don’t get me started on burgers. Caramelized onions, barbecue sauce, basically whatever I can find. Smoothie bowls are no exception. What sets a smoothie bowl apart from a traditional smoothie is not the spoon (because let’s be real, a straw is far easier), but it’s the TOPPINGS. 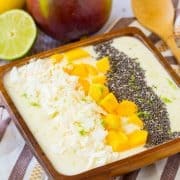 This one got decked out with lime zest, fresh mango, chia seeds and tons of flaked coconut. FRUIT. All the fruit, obviously. Strawberries, bananas, blueberries, starfruit…you name it, it’s in the running for a place on top of a smoothie bowl. Oats! I topped my apple crisp smoothie with some rolled oats and they added a great element of chewiness. Seeds or Nuts. If you can find it, it’s fair game. Pepitas, chia, flax, almonds, walnuts, anything your heart desires. Jam or nut butters – Nut butters aren’t around in our house, but they add a great source of protein and flavor. The list goes on and on….these are so fun! 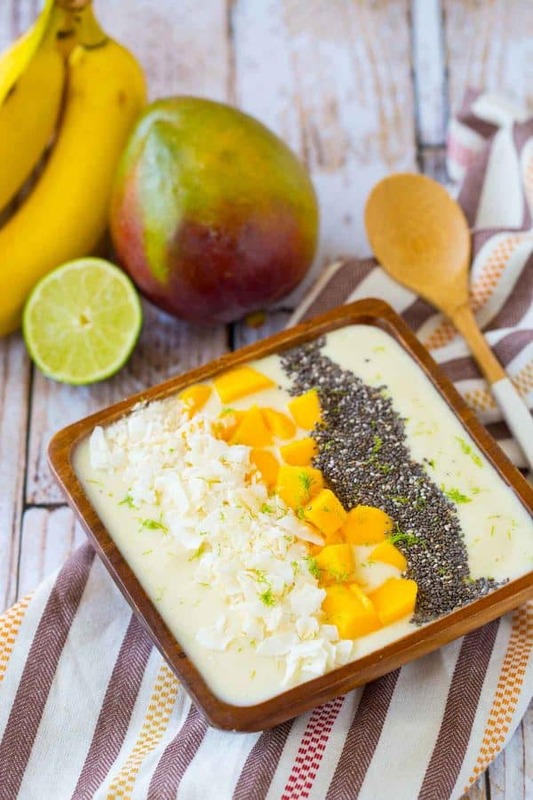 This tropical smoothie bowl uses frozen pineapple and frozen bananas for a nice thick texture. 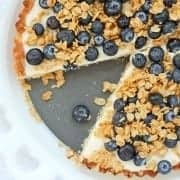 Combined with Greek yogurt, it’s a filling and flavorful way to start your day feeling like you’re in the tropics. Let’s throw a paper umbrella on there, shall we? In a blender, add pineapple, banana, yogurt, coconut, and lime juice. Blend until smooth, adding water or juice as necessary to let your blender do its thing. Taste and add honey to taste. 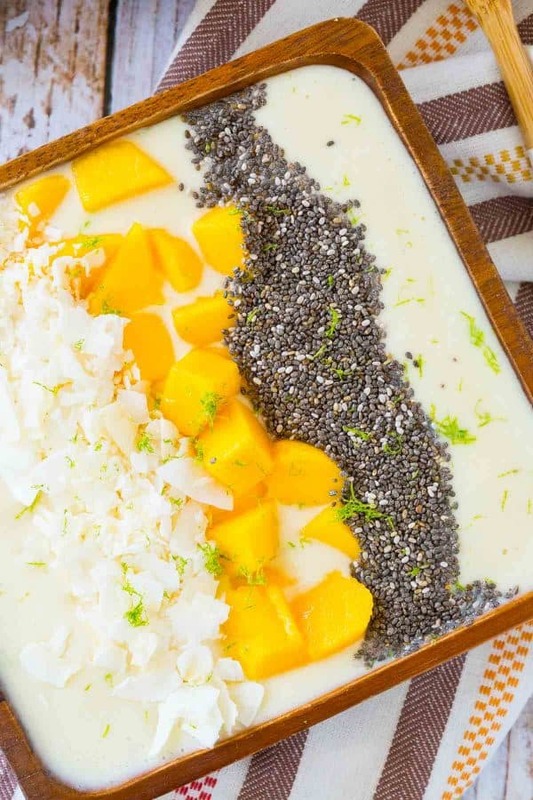 Pour into a bowl and top with coconut, chia seeds, mango and lime zest. Verdict: I loved the tropical flavors of this smoothie bowl. Don’t skip the lime, it really adds such a great bright citrus touch. Husband’s take: He loves this tropical smoothie bowl. He ate most of it the day I photographed the recipe. Changes I would make: None are necessary but you can feel free to play around with it. Add some mango to the smoothie itself or try it with pineapple juice or coconut water. It’s pretty forgiving.